Alliums add a splash of color to your garden and yard with bright blossoms in pink, blue, purple, yellow, white or beige. These tall flowering plants are part of the onion and garlic family and bloom between spring and fall. If you want to preserve these beautiful flowers' splendor before they die off, you can dry them and use them as decorations for the inside of your home. The simple process boasts big rewards in the form of perfectly preserved flowers for a floral arrangement. Water the alliums when they are at full bloom, the day before you plan to pick them. Cut the alliums the next day at the base of the stem. 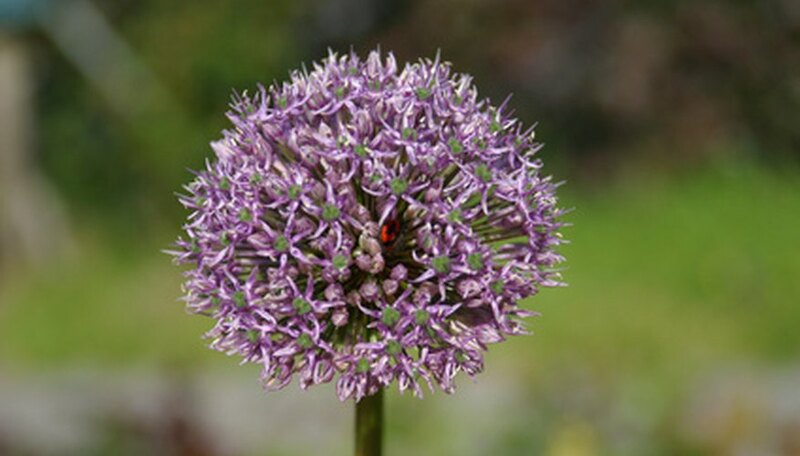 Inspect the allium flowers for insects or dirt and brush them off before you bring them inside. Place the flowers in a tall, narrow vase, with 1 to 2 inches of water, to keep them from falling over. Place the vase in a cool, dry place out of direct sunlight for up to 10 days to allow the water to be absorbed and the flowers to dry out. Use no more than 2 inches of water and do not refill it.